All your annual CEUs at one low price! Home Health Advanced Competency - New PTA version available! The Home Health Section’s Advanced Competency in Home Health program synthesizes current evidence-based practice and tailors it to the unique physical therapy setting of home health. Learn more about the program! APTA Now offers access to course content delivered by approved providers to allow our learners to obtain the very best training available in the industry. Check out our Preferred Providers page and see what's New! Did you know about these offerings for Educators? NEW! Catalog of Education Opportunities for Educators - Check it out! AIUM Partnered Webinars - Free To APTA Members. Learn how Ultrasound can enhance the PT profession? The Opioid Epidemic: You May be Ready! 3. CSM CEUs ARE AVAILABLE NOW! 4. CSM Pre-Con CEUs available NOW! Login to the Learning Center and scroll to the Pre-Con, complete the assessment and evaluation, claim your certificate. 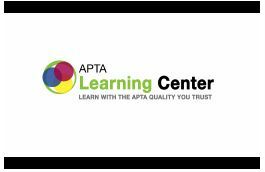 Members take a look at over 30 courses that are free to APTA members. How Changing Post-Acute Payments Impact the Role of the PT - VIRTUAL Q and A - October 11 - 19 FREE! Everything you need to know about the Quality Payment Program - 1 PM - October 16th FREE! HIPAA - 1 PM - October 23rd FREE! Coding and Billing Updates: The Move to Value-Based Payment - 1 PM - December 4th FREE! Want MORE CEU's - FOR FREE?? click on the “CEUs” tab for results. Detailed instructions for finding CEs inside RRC are also available from this FAQ. Never been to PTNow? PTNow is APTA’s member-only website containing tools to advance physical therapist practice – clinical practice guidelines, clinical summaries, evidence databases, systematic reviews, tests and measures, and more. Check it out! [Member login required.] For additional information, contact: articlesearch@apta.org. Some of our Most Popular! How to survive a Medicare Audit!